It's one of the Barefoot Contessa's favorite weeknight meals! It's no secret that Ina Garten and her husband Jeffrey absolutely love roast chicken. However, if the Barefoot Contessa just had to pick a second favorite dinner, she's ready to spice things up Italian style with an easy dish that comes together in a lot less time than it takes to roast a whole bird. World, meet Garten's Parmesan chicken. No, this isn't chicken Parmesan (don't get them twisted!) but it looks absolutely delicious. On Thursday, Garten shared a photo on Instagram of the herb-breaded chicken dish, which she paired alongside salad greens tossed in a simple lemon vinaigrette. The best news, however, is that Garten said the entire meal took just 30 minutes to prepare. Also, this dish won't require you to go grocery shopping for a ton of new spices and extras that you'll only use once. The full chicken recipe requires just 11 ingredients, many of which are probably already in your pantry. The Barefoot Contessa shared the full recipe on her website, settling the age-old question that millions of hungry people ask themselves every night: "What should I make for dinner?" Of course, Garten has plenty of chicken recipes in her arsenal that she has perfected over the years. 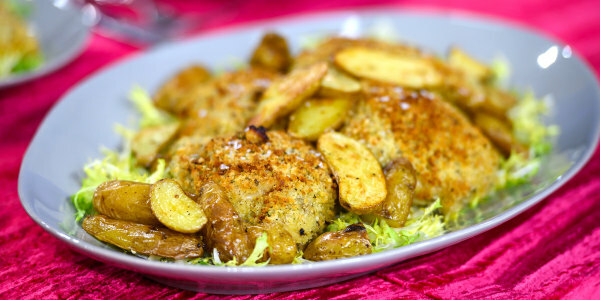 In December, she stopped by the TODAY kitchen to showcase another crispy chicken dish (which is made all the more flavorful with zesty mustard, garlic and thyme), and paired it with crispy potatoes and a simple frisée salad for a refined comfort-food classic. Now that spring is here, it's also worth revisiting Garten's tips for throwing an impressive dinner party. She reveals how to avoid having a "total kitchen meltdown" no matter how many people you're serving. "This time of year, I start with a list of spring ingredients that are popping up in stores everywhere — little radishes, baby lettuces, asparagus, and rhubarb," she advised. Sounds like the beginning of a delicious salad base already. Leave it to Garten to always help us find the perfect dish.